“Heating” is a traditional technique known to humanity. It has been everchanging the way we live. There are an innumerable ways in which we have been generating heat and using the heat to do work. One of the key applications of “heat” has been the Industrial Process Applications. Design of an industrial heating system starts with assessment of the temperature required, the amount of heat required, and the feasible modes of transferring heat energy. In addition to conduction, convection and radiation, electromagnetic heating methods can use electric and magnetic fields to heat material. Low-temperature (RT to about 400 °C), which include baking and drying, curing finishes, soldering, molding and shaping plastics. Medium temperature (between 400 °C and 1150 °C ), which include melting plastics and some non-metals for casting or reshaping, as well as annealing, stress-relieving and heat-treating metals. High temperature (beyond 1150 °C ), which include steelmaking, brazing, welding, casting metals, cutting, smelting and the preparation of some chemicals. 1. Steam-Based Heating: Heating Steam has several favorable properties for process heating applications. Steam holds a significant amount of energy on unit mass basis (between 1,000 and 1,250 British thermal units per pound [Btu/lb]). Since most of the heat content of steam is stored as latent heat, large quantities of heat can be transferred efficiently at a constant temperature, which is a useful attribute in many process heating applications. Steam-based heating heating has low toxicity, ease of transportability, and high heat capacity. 2. Fuel-Based Heating: Heating with fuel-based systems, heat is generated by the combustion of solid, liquid, or gaseous fuel, and transferred either directly or indirectly to the material. The combustion gases can be either in contact with the material (direct heating), or be confined and thus be separated from the material (indirect heating, e.g., radiant burner tube, retort, muffle). Examples of fuel-based heating equipment include furnaces, ovens, kilns, lehrs, and melters. Within the United States, fuel-based heating (excluding electricity and steam generation) consumes 5.2 quads of energy annually, one which equals roughly 17% of total industrial energy use. 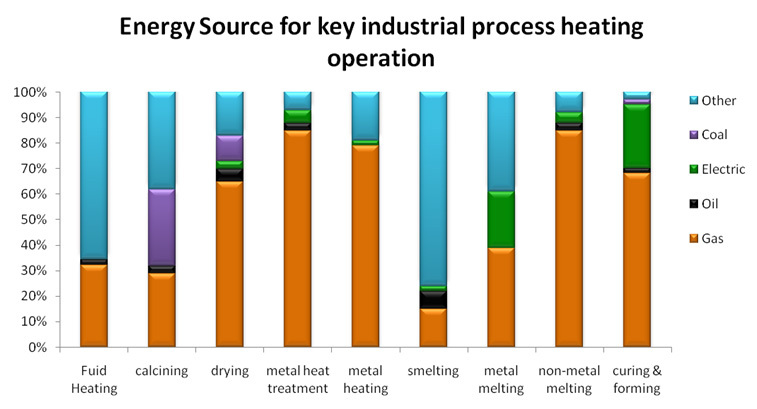 Typically, the energy used for process heating accounts for 2% to 15% of the total production cost. (3) exciting atoms and/or molecules within the material with electromagnetic radiation (e.g., microwave). Indirect heating methods use one of these three methods to heat an element or Susceptor, which transfers the heat to the work piece by either conduction, convection, radiation, or a combination of these. use a combination of process heating systems by using different energy sources or different heating methods of the same energy source. Electric infrared, in combination with either an electric convection oven or a gas convection oven is a hybrid system. A paper drying process that combines a natural gas or electric-based infrared technology with a steam-based drum dryer is also a hybrid system. Advantages of electric heating methods over other forms include precision control of temperature and distribution of heat energy, combustion not used to develop heat and the ability to attain temperatures not readily achievable with chemical combustion. Electric heat can be accurately applied at the precise point needed in a process, at high concentration of power per unit area or volume. The heating apparatus can be built in any required size and can be located anywhere within a plant. The Electric heating processes are generally clean, quiet, and do not emit much byproduct heat to the surroundings. Furthermore these heating equipments have a high speed of response, lending it to rapid-cycling mass-production equipment. Typically Electric Heating Methods include Resistance Heating, Ohmic Heating, Induction Heating, RF/Dielectric Heating, Microwave Heating, Infrared and Ultraviolet Heating. Each of these heating methods offer unique advantages of their own in different domains of applications.